Floor is a specific thing, it is an important part of interior and it is perceived not only optically, as for example walls or ceilings, but also in a tactile way as an object designed for our moving around room. When we look at floor, we assess not only its aesthetics but also whether it is comfortable to walk on it. That is why while choosing kind of design of floor one should pay special attention to material and quality of cover, and only then to its aesthetic qualities. Inequalities of concrete base on floor which can be seen through thin linoleum, knobs on wooden floor, creaking and slipperiness of parquet, coldness of ceramic or marble floor, warm coziness of carpet flooring; all that make a double impression on us, when we judge not aesthetics of a particular floor covering but its expected comfort. most unpleasant peculiarity of mass (not individual) building is imposing of a particular interior for an apartment (wall, ceiling and floor cover) as if future owner is impersonal. That is why most of us take floor cover of our flats and houses as something already decided, as entity, which is not for us to decide. Though floor cover is not so easy to change or make better, it is up to us to change perception of it. First of all we should take into consideration future or present furnishing of room; its quantity will influence perception of floor and its place in interior of room. While evaluating aesthetic possibilities of floor in some particular room we should bare in mind that floor covering, no matter of what material it is made or what aesthetic qualities it has, makes a big impression if a big part of its surface is not occupied with furniture. Special attention should be paid to floor design in big specious rooms where there is little furniture, and in a small room with lots of furniture it is not so important. A large part of floor surface without furniture will impress more by its texture of material than a small part of it in a tiny room. Marble looks humiliated in one square meter in bathroom. A rich with beautiful design carpet looks cut when it is partially under furniture. Mosaic colorful parquet with huge figures will not make desired impression in a small room. Floor covering with big pictures or big elements (tiles, parquet blocks, boards and so on), also materials with large texture (marble, long tufted carpet, linoleum imitating wood with large texture, brick or stone laying) should be used in large rooms. smaller room is smaller should be elements which determine texture of floor covering, its design, texture and joints. Carpet and linoleum floor covering and carpets with large colorful and clear design should be used in rooms which are not less than 20 square meters. Only self-colored covering should be used in rooms which are less than 10-12 square meters. Floor covering from marble will be aesthetically approved on floor which is not less than 10 square meters. If surface of floor (in bathroom for example) is less than 10 square meters, marble should be put on walls as well. Parquet floor with large squares marked by group of parquet blocks put in one direction should be used in rooms which are not less than 17-20 square meters. Wood flooring in small rooms should be made from boards no more than 10 centimeters wide. Ceramic, stone or plastic tiles which have dimension 20x20 centimeters should be laid on floor which is not less than 10 square meters. Linoleum covering which have separate designs or elements imitating others materials with dimensions more than 20 centimeters should be used on floor surface of no less than 15 square meters (linoleum design looks much clearer than design of other materials). 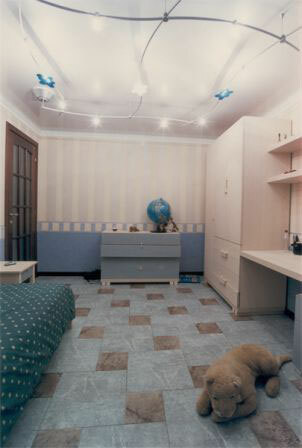 Design tiles are used on floors with surface no less than 10 square meters. Napless or with short tufts and small stitches textiles should be used for carpet covering in small rooms. While choosing floor covering wee should take into consideration that with its help it is possible to optically change geometrical form of room. For instance, if room is long and narrow, parquet blocks (or boards) should be laid across width of room; in case covering is made of ceramics or stone it is preferable to use rectangular not square tiles, putting their long sides in cross direction to long side of room. same things should be kept in mind while choosing linoleum floor covering: long elements of its design should be in cross direction to room. Well-marked texture of natural materials (for example, knots and lines of annual rings of a tree, stria of marble) raggles between boards or between tiles, strongly marked picture of artificial materials are very suitable for floor covering as they create an optical effect of surface prominency, and that may cause a subconscious feeling of movement obstructions. The bigger room is greater impression should be made by floor.Timber floor painted even with best paint will bring to naught all your design efforts (if you have used them) to make interior of living-room look, for example, beautiful and charming. At same time marvelous parquet will look silly in a place where there is not enough room to swing a cat in. Glazed, shiny and smooth floor are preferable in small rooms. main rules of floor covering color and its surface matching are nearly same as rules of an object color and size matching. Applying these principles on color design of floor, we shall only concretize that colorful, deep tone of floor in a small room will irritate, and it will pack whole space.If we paraphrase above recommended rule about correspondence of character of floor design and its size in small rooms, it can be formulated in following way: simpler room is simpler should floor look. While choosing material for floor covering, its color and texture do not forget about their matching with color and texture of material of walls. Remember that aesthetic connection of walls and floor must be broken by no means. Disharmony of these important aesthetic elements of interior, no matter how well they are designed separately, will make interior artistically unideaed and inexpressive. Shiny color or original texture or picture of floors will loose their expressiveness, if floors compete with even more colorful walls or other surfaces of interior. rule of contrast harmony with other elements of interior must be absolutely observed for floor. What will play a dominant role, walls or floor, depends on interior situation of room. If a big part of surface of floor is not occupied, and walls are hidden behind huge furniture and elements of decor, it will be logical to lay emphasis on floor. In that case main decorative points should be concentrated on floor and walls should look simpler: expressive design on floor should not be same as design of walls. If floor covering is made from wood, there is no point in covering walls with wood or material imitating wood. Geometric elements of floor design - bars, squares, rhombs, and triangles - must not be repeated in covering of walls. Combination of close but differently deep colors of floor and walls will create a calm and representative atmosphere in room and it can be accepted as simplest and most convenient variant of harmony of interior. In a classical variant when floor is covered with linoleum of yellow-brown color, which is close to tone of wood, it is preferable to decorate walls with wallpaper or some other covering (for example colorful) of beige, yellow-brown, light-brown and light-olive tones. Remember rule, which says that walls must be lighter than floor! In goes without saying that it is difficult to put an accent on floor in our small rooms, which are typical for our multistoried buildings, because even best and most expressive finishing material will poor in a small piece of surface which is not occupied with furniture. main emphasis in interior must be made on walls if we speak about connection of walls and floor. Inexpressive floor covering in small rooms is worth changing as it will not influence its interior strongly. Try to focus your design efforts on correct material, picture and color of walls; and middle of floor which is not occupied with furniture cover with a carpet of an appropriate color and size, preferably with a vivid picture in middle. It will visually make floor smaller, but at same time it will distract attention from its dull parts which can be seen from under furniture. While putting carpets on floor make use of following recommendations. Choose place to put a carpet according to planning or existing placement of furniture. If there is or supposed to be a sofa, a bed or some armchairs carpet should be symmetric to them. If carpet does not cover whole surface of floor, then its color should contrast color of floor (for example, red and yellow) - contrast harmony will make an impression that surface of floor even: it will be divided in separate color parts. It is preferable to use floor carpets of tame colors and calm shades, without any flourishes or intricate designs.If we speak about floor covering of separate rooms in house baring in mind their functional specifics, then we should take into consideration following. Self-colored floor covering in halls, kitchens, bathrooms and other small utility rooms are more preferable than semi colored covering. Putting immovable carpeting in entrance lobby is not rational, as it may cause some problems in taking care of it. 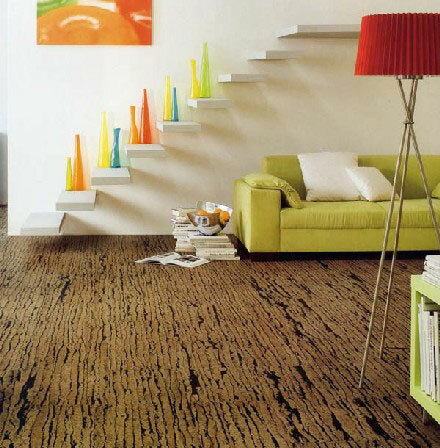 Mere carpeting made from synthetic fibers is not preferable in small bedrooms and nursery rooms. Long fluffs of covering and covering imitating animal fur (and also made from natural fur) use only as local covering (that means not on whole surface of floor) and put mostly in living-rooms and only in places it will not be effected much (for example, in front of a sofa or a bed). It is not very comfortable to walk on these floor coverings. in terraces and balconies - linoleum. In conclusion following important moment should be mentioned: making quality and beautiful floor covering is an expensive and time-consuming process. Like everything that is supposed to be used for a long time, material and aesthetic stylistics of floor should not be subjected to changing fashion crazes. All kinds of "d�corations" in form of extravagant designs and materials (something like vanished colorful textile fixed on a wooden floor) and other tricks created by amateur enthusiastic designers or smart temporizers can bore you so much in some years or discredit their features that you will have to redo floor covering from very start.